The 2006 Big Dog Pit Bull Chopper for sale has a 117 CI S&S motor with a Baker six speed transmission and a gorgeous candy red paint job that is stunning in the sun. The Pit Bull also has a sissy bar for additional support which is removable. 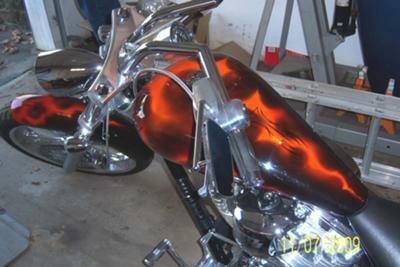 Anyone that has experience with the 2006 model Pit Bull chopper can use the comments form below this ad to write a review or voice any opinions that you may have on its reliability, performance, problems or where to find used custom motorcycle parts. Thanks for visiting GoGoCycles Used Motorcycles for Sale and for your interest in this custom motorcycle. The location of the 2006 Big Dog Pit Bull Chopper for sale is Savannah GA (near Atlanta GA) and my asking price is just $12990! If you want to take a look or have questions, call me (NO EMAILS) at 912-964-4four22 for more details or to request picture and don't forget to mention that you found this ad on GoGoCycles Used Motorcycles and Parts for Sale www.gogocycles.com.